Picking up from the last issue, the Power Rangers have the upper hand over Batman and Flash, when the rest of the League show up and level the playing field. The two teams battle, then realize they are on the same side. Meanwhile, Lord Zedd discovers he has been transported somewhere not on Earth. He learns that he is a prisoner in a bottle city. Zedd then uses his vast powers to grow to the same size as his captor... Brainiac. The two learn they have an equal thirst for power and conquest and strike up a deal. Lastly we see Earth being attacked by monsters, that Brainiac and Zedd unleashed, and the Justice League and Power Rangers deploying into action to stop them. Story - 4: Well, this was the typical "heroes meet for the first time and then fight" part of the crossover. Was an interesting look at the two teams squaring off with one another. 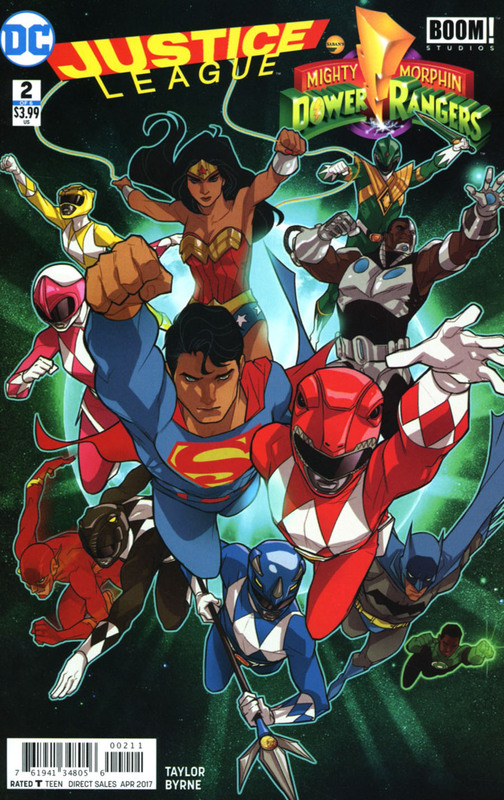 I realize that you can't make one team look weaker than the other in a crossover such as this, but we have to admit, the Power Rangers are out of their league... No pun intended. I didn't really care for Batman this issue blaming Zack for the misunderstanding and subsequent fight between the teams, or when the Rangers explained that they can't leave the DCU earth until they capture Lord Zedd. Batman is a jerk, but if he is as smart as how they portray him, then he should know that it isn't Zack's fault. Brainiac being the villain explains the vague start to this series in the last issue, and the city on the Rangers' Earth missing. We can guess that Brainiac makes his way to the "PRU" and takes their city for his collection. It's not a bad crossover so far, it's actually a fun read. I'm looking forward to the next issue. Art - 4: Steven Byrne does a good job on the art and coloring chores again this issue. Byrne's rendition of the Power Rangers is stronger than his Justice League for certain. His Power Rangers and their Zords really look flawless. They seem like they stepped right out of the 90's TV show. With that said, his Justice League depictions came off a little weak. They just felt "off". I initially thought that maybe they just weren't as larger than life as how they're usually depicted, but upon a further careful study of the art, I think that it's just because they seem a little to "cartoonish" in their facial features and body language at times, and a little less muscular and traditional than what we are used to. I feel Byrne needs to find the right balance between cartoony and real life when it comes to the Justice League. Brainiac seemed a little less menacing, not sure if that is because of the Gary Frank design from Superman: Brainiac or just the way Byrne draws him. However, it was exciting to see him as the big bad! Lastly the colors fit the tone of the book well. Byrne did a great job with them. Both teams have a rainbow of colors in their costumes, so balancing those would be a challenge I'd imagine. Good job sir. Cover Art - 5: Karl Kershl provides a really solid cover, though Superman and Red Ranger seem as though they are flying almost arm in arm. Another detail to note, it seems that Kershl drew the iconic Superman suit, you can see where he drew the trunks, and the coloring tries to correct the suit and make it fit the modern current costume.